Virtually every morning I go out to fill the bird feeders in my backyard before I leave for work, and I have been hearing White-Crowned and White-Throated Sparrows singing for weeks, but I never see them. Looking out the windows I am used to see them foraging around on the ground, but this has not happened. So yesterday afternoon, which was absolutely gorgeous and sunlit, when I went out to sit and dig up the patch of pigwort that has invaded one section of the yard, I took the camera with me, just in case. I was rewarded with the presence of three White-Crowned Sparrows and two White-Throated Sparrows. The White-Throateds showed up first, digging around at the bottom of the compost pile and then sometimes in it. They didn’t stay very long, however. Eventually I noticed something interesting: one White-Crowned Sparrow was nibbling on a piece of spray millet that I had just recently added to the compost bin. I realized some time last week that I have been throwing out chewed-up spray millet every day with the cage papers and waste from my indoor birds, which means it’s been going needlessly to the landfill. It never occurred to me that someone might find the uneaten portions of this delightful treat irresistible. The other attraction seemed to be little leftover bits of shelled peanuts. The squirrels probably get the majority of them but the birds have been onto this use of the tree stump for a while. I keep hoping for crows but I’ll take White-Crowned Sparrows anytime. In case you’re wondering what the back view of a White-Crowned Sparrow looks like, here’s one shot from under the feeder pole. The weather is still unseasonably cool but that’s nothing for the sparrows. I’m hoping they’ll stick around maybe for another week so I can continue to hear their beautiful songs. Yesterday as I had to go back into the house to resume indoor duties, I was treated to a little late-afternoon/early evening chorus I wish I had been able to record. One White-Throated Sparrow started out singing in B-flat, then a mourning dove joined in, in the same key, and then a House Finch started carrying on with his busy song. No people noise interrupted their singing. This was likely a one-time experience I’ll have to keep in my head, but it will remind me to take the recorder with me next time. In the mad rush to the end of the year there hasn’t been much time for birding or posting but I am here to wish you all happy, good-cheer holidays, whatever you are celebrating. Last night I sang with the Unity Temple Choir for their Christmas Eve service and today I am catching up on bread gifts to distribute around the neighborhood. So while the house smells of cinnamon and yeast, Handel’s Messiah playing on the radio, and snow still on the ground even though we’ve warmed up quite a bit, I will try to compile a brief photographic history of the last few weeks. Most of the wild birds I have seen lately have been downtown on infrequent visits to the parks. The light hasn’t been anything to celebrate but the Black-Capped Chickadees, White-Throated Sparrows, House Sparrows and Northern Cardinals are all happy to partake of the treats I bring them. 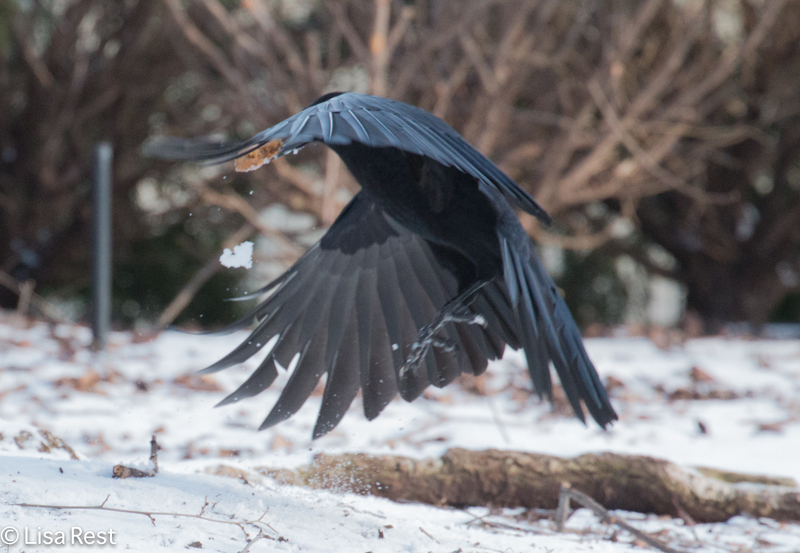 And although I haven’t had many crows, I am usually able to find at least two, sometimes four. I don’t know where they’ve gone this year. Maybe the polar vortex has caused them to congregate elsewhere. Too bad, because I’m baking Birdz Cookies now, and I’ve perfected the recipe. Sometimes there are a few American Robins about, although not as much now that the trees and bushes are running out of fruit. There was that one horribly cold week and I managed to document the temperature and the steam on the river, if nothing else. I didn’t go out that day. Two days later it had warmed up a bit, for which I was grateful, as I participated in the Fermilab Christmas Bird Count, but it was a brutal experience slogging through packed snow and seeing not many birds at all. 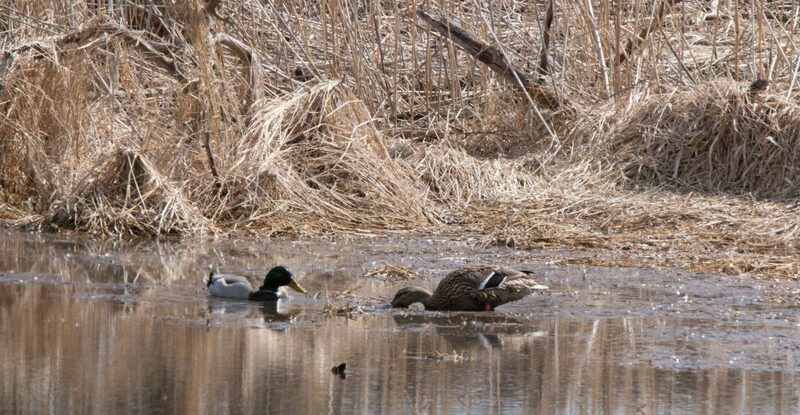 Not surprisingly, overall, the number of species and individuals were down from previous years. The Canada Geese flying overhead seemed to be the only ones having a good time. I couldn’t even get the pair of Northern Cardinals below to come out from the thicket long enough to photograph them. What’s been really shocking to me is the lack of birds in my yard. While I don’t see them most of the time because I’m at work anyway, at least I have an idea that they’re showing up by the emptiness of the feeders. Oddly enough, just as we started the warmup this past week, my feeders remained full. You would think just the opposite would occur. I began to wonder if the sub-zero temperatures had taken more casualties than a more normal winter. I hope this isn’t a warning for the future. I have seen birds in the yard today now that I’m home, and I’m starting to think that a good deal of the absences probably have to do with the local raptors’ hunger more than the weather. We shall see. The birds come, but they don’t stay long. I’ll try to do a census tomorrow in the yard since I would like to see my favorites beyond the inevitable House Sparrows. I may even go out to the Portage for a walk-around early in the morning. We’re supposed to have relatively balmy temperatures tomorrow morning before we go back to normal. A seesaw December. And only one week left of it. Wishing you all love and peace! The weather finally turned cold enough last week to warrant baking the Birdz Cookies, which have gone through several iterations over time. I have managed to find a way to cut down on the sugar content and increase the peanut butter, which suits the Crows just fine. There were a few White-Throated Sparrows too. It still amuses me that they have chosen Millennium Park for a winter habitat, but I suspect they picked up lots of tips from the House Sparrows and are able to get enough food and shelter to make a go of it. On this day there was only one individual available for pictures. I haven’t been out to see the Crows all week but I’m going to visit them today. Very chilly today but we are supposed to have a two-day warming trend. Until the next post, I leave you with a few more pictures from last Friday. It’s very likely the Crows are paying attention while I’m posting this and salivating in advance. Not much going on around here. Dull days of winter. But whenever there’s the occasional bright and sunny day, and Sunday was one of them, one must get outside, so before I went for an afternoon walk with Lesa at Miller Meadow, I sat out in the yard albeit rather uncomfortably on an overturned trash can, to be far away enough from the feeders so the birds would come back in, and come back in they did. First to lead the charge was a female Downy Woodpecker, taking advantage of the fact that the crowd had not arrived yet. Then I saw the White-Breasted Nuthatch who has been visiting this winter, and no sooner did I suggest to him that he bring a friend than a second one appeared, perhaps a female although not easy to tell from these pictures. I think in the second photo below, the female is on the feeder with the House Sparrow above and the male is on the peanut feeder, the male having more prominent black on the crown and nape. This is also the first time I’ve seen these birds on the seed feeders. One little Dark-Eyed Junco showed up although I’m afraid due to distance and shadows I didn’t do him much justice. There was also one American Tree Sparrow. I think there may have been another one but since I never saw the two at once I can’t be sure. Even in my own little yard birding gets tricky! This Tree Sparrow likes the attention. 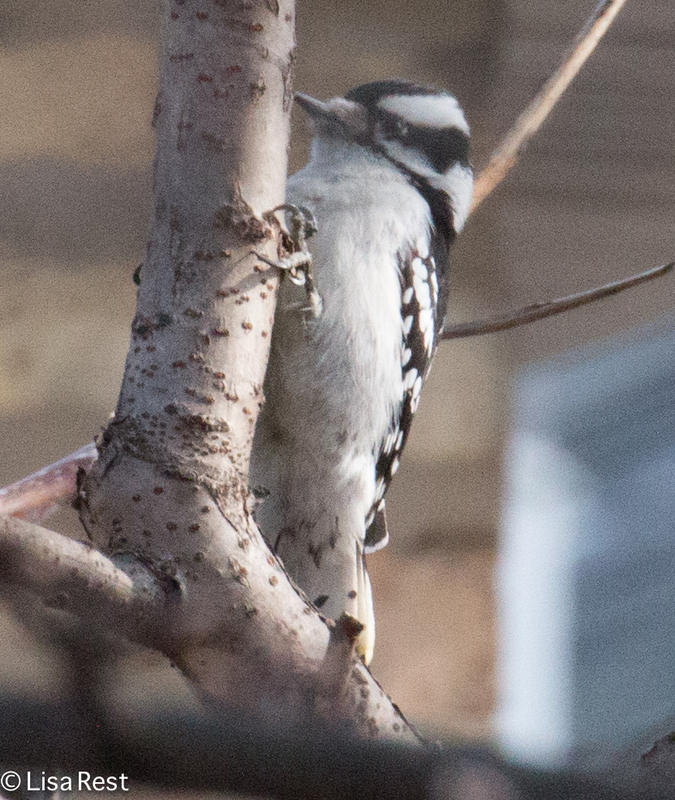 After I got back inside, a male Downy Woodpecker flew onto the peanut feeder and I managed to capture this soft-looking image through the window screen. Disclaimer and/or Apology Time: Other than work, weather and choir singing distractions I confess to being mesmerized by the current Bernie phenomenon, which only adds to staring-at-a-screen time (I never followed anything like this before, but different stories appear depending on what device you’re using, making for even more distraction). I got rid of my land line and my cable service last week, but none of that has helped my focus.